By Drew Wham Whether it’s the scientific name or the variety name of a particular coral, reef aquarists want to be able to identify what they have in their tanks. The identity of a coral offers critical information. What’s This One Called? Members of the same species generally have the same husbandry requirements. Knowing a new specimens species assignment can tell you what kind of lighting it might need, how it might grow and if you need to worry about it killing it’s neighbor in three months. Members of the same species, however, can sometimes be quite different, especially in their coloration. So aquarists give (often humorous) names to corals with particularly nice color morphology. These names serve as identifiers for particular individuals. They let you know what your dime sized frag will look like in 2 years and may even provide a link back to the original owner. Just as every show dog must come with papers from a respectable breeder, these names can vouch for a coral’s genealogy. 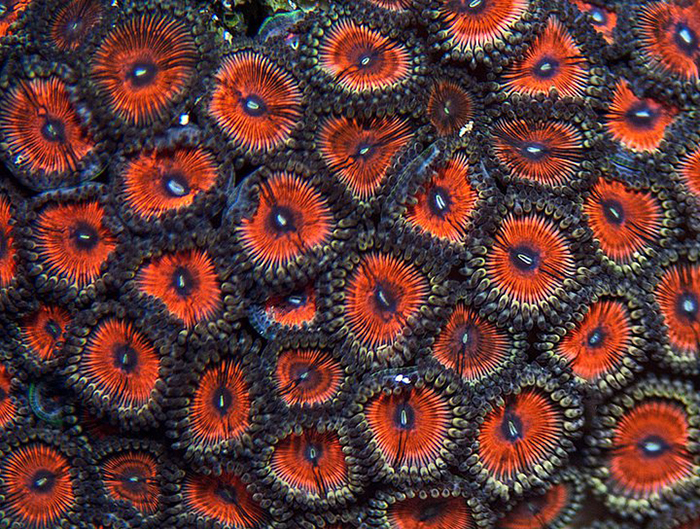 Z. sansibaricus and Z. sociatus are some of the most common Zoanthids kept in the hobby, they also may be the most diverse in color morphology. Photo by Sanjay Joshi. Zoanthus sansibaricus (Indo-Pacific) Zoanthus sociatus (Caribbean)Aquarium ID: Look for interconnected polyps with oral disks 6-10mm in size Reimer et al. 2004), often with pink ring around closed polyp but this is not always present so shouldn’t be used as diagnostic. 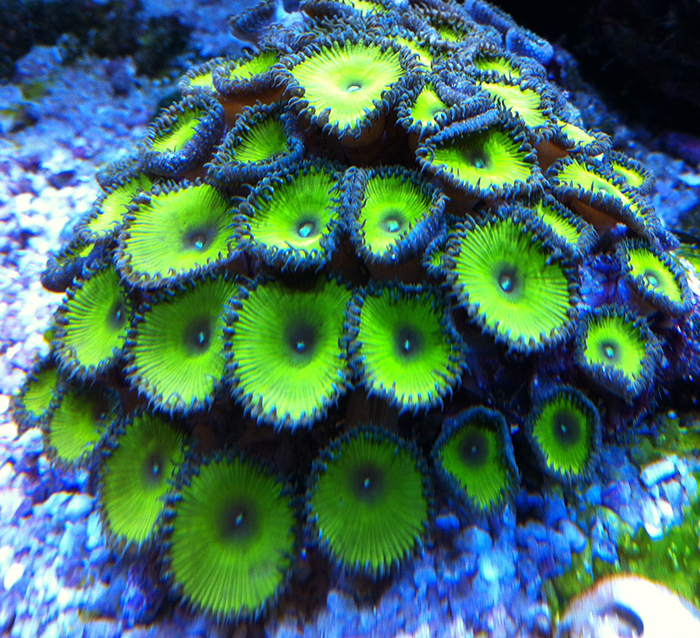 This may be the most common type ofZoanthus in the aquarium trade. Common Variety Names: Eagle Eyes, Wham’n Watermelon, Radioactive Dragon Eyes and many, many more. Known Symbionts: (Z. sansibaricus) Primary symbiont Symbiodinium C3ee-ff(AKA C1z Reimer 2008) high light adapted. Also found in association with a clade A Symbiodinium but only in colonies that are under light and desiccation exposure at low tide. Additionally, a different Symbiodinium C type is found in deep colonies around Japan. (Z. sociatus) Primary symbiont is C1 (Lajeunesse et al. 2002), a wide spread host generalist symbiont that associates with many coral taxa. It is adapted to high light but may be sensitive to temperature stress. Japan Deep-water Zoanthids: Most Zoanthids traded under this name are Z. sansibaricus and this is the only member of the genus discussed here that has collection records as deep as 35m (Reimer et al. 2004, Kamezaki et al. 2013, Wham et al. 2013). Genetic evidence does not support differentiation between shallow and deep colonies (Kamezaki et al. 2013, Wham et al. 2013), however, symbiotic association does vary across depth (Kamezaki et al. 2013). It is possible that Z. sansibaricus colonies might be collected from a deep location and designated “Deep-Water” and exhibit a preference for lower light. It is, however, unlikely that colonies sold under this designation are truly from Japan. In the author’s opinion, it is unlikely that the colonies even originate from deep collections. The lack of genetic differences would indicate that the exact color morphs could be found in both deep and shallow locations and symbiotic association would likely change to match aquarium conditions in a few months. In short, the Japan Deep-water designation is probably just hype and the designation should be dropped from the hobby. Zoanthus gigantus (Indo-Pacific) Zoanthus solanderi (Caribbean)Aquarium ID: They can be identified by their larger size, often having green mouths and generally display a “stripped” pattern on the closed polyps (Reimer et al 2006a). Oral disk ranges in size from 10-25mm (Reimer et al 2006a), some individuals may even be larger. They are often referred to as “Palys” this should be actively discouraged by the community, as Paly is short for Palythoa and they are not part of the Palythoa Genus. Common Variety Names: PPE, RPE, basically all the “People Eaters”. Known Symbionts: Zoanthus gigantus (Indo-Pacific) Unnamed C1/C3 related Symbiodinum specific to Z. gigantus found in high light environments. DNA evidence suggests that it is closely related to C3ee-ff found in Z. sansibaricus(Reimer et al. 2006b), which would explain its similar lighting preferences.Zoanthus solanderi (Caribbean) No identification of associated Symbiodinium has been preformed on this species. Zoanthus pulchellus (Caribbean) Zoanthus vietnamensis (Indo-Pacific)Aquarium ID: polyps of 4-6mm in diameter, height of 4-30mm and 50-60 tentacles ((Reimer 2010, Reimer et al. 2012). I however have observed larger polyps. They are generally larger than Z. sansibaricus and Z. sociatus but smaller than Z. gigantus and Z. solanderi generally they have white mouths and lack the large stripes found on the closed polyps of Z. gigantus and Z. solanderi. Oral disks are often colored red, pink or purple with a radial pattern extending from the center. Common Variety Names: Armor of God, Armageddon, Bowser, Candy Apple Red, DayTrippers, Goochsters. Known Symbionts: Zoanthus vietnamensis (Indo-Pacific) Found in association with a relative of C15 (Reimer 2008) a particularly robust symbiont that is tolerant of a number of environmental stressors including temperature stress. Zoanthus pulchellus (Caribbean) No identification of associated Symbiodinium has been preformed on this species, however it should be noted that C15 does not occur in the Caribbean and so Z. pulchellus may not show the same degree of stress tolerance as its sister species owing to its likely association with a generalist symbiont such as C1. Zoanthus kuroshio (Indo-Pacific) Zoanthus aff. pulchellus (Caribbean)Aquarium ID: Polyp openings only rise a couple of mm above the encrusting base when closed. 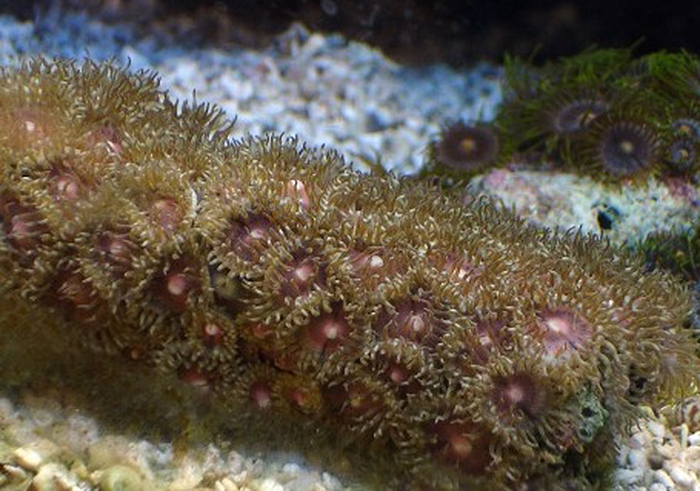 Unlike the other members of Zoanthus, polyps are embedded into the coenechyme forming a distinctively mat-like colony. The polyps of Z. kuroshio(Indo-Pacific) are often pink in color (Reimer 2010) with a radial pattern extending from center and a white mouth, very similar to Z. pulchellus and Z. vietnamensis. The polyps of Zoanthus aff. pulchellus (Caribbean) often occur in a larger variety of colors. These species often suffer from a white fungus or mold like disease and are very difficult to establish in the aquarium. 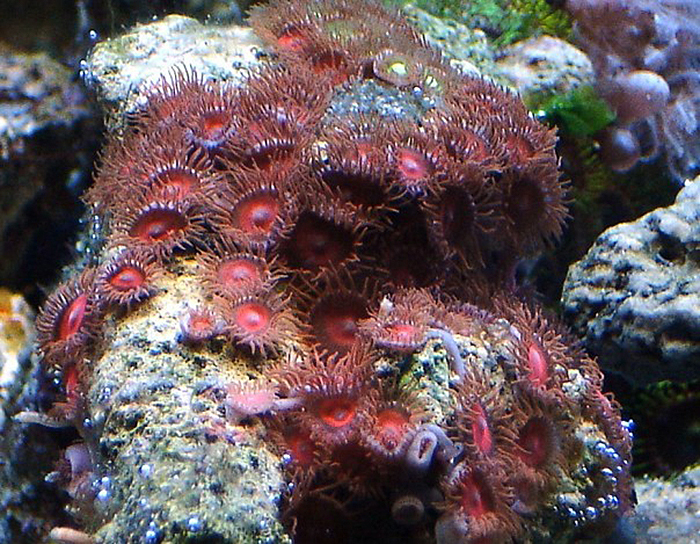 Common Variety Names: Often sold as Bubblegum Pink Zoanthids. Known Symbionts: Similar to its close relative Z. vietnamensis, Z. kuroshio (Indo-Pacific) associates with a C15 related symbiont (Reimer 2008). No identification of associated Symbiodinium has been reported for Z. aff. pulchellus (Caribbean). Distinguishing the Genus Palythoa from Zoanthus Members of Zoanthus do not incorporate sand into their polyps, members ofPalythoa do incorporate sand and other debris into their polyps. 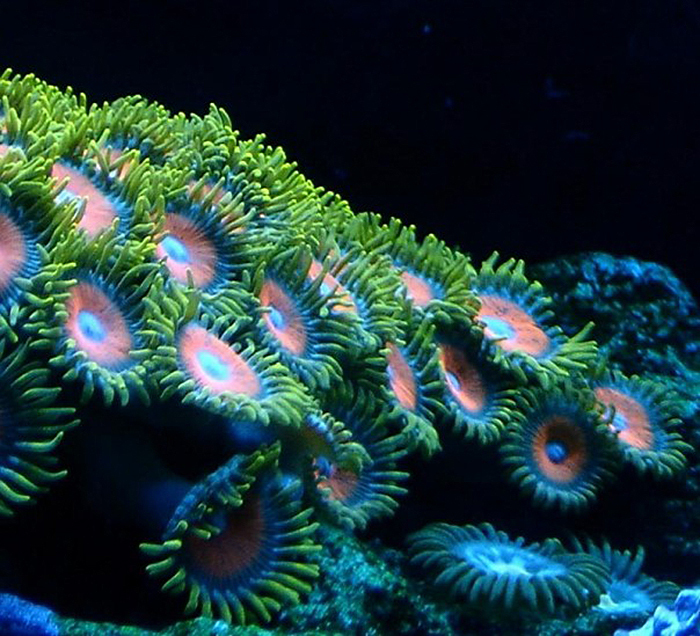 The confusion in the hobby is mostly from the incorrect usage of “Paly” to refer to individuals of the species Zoanthus gigantus, Zoanthus solanderi. This should be actively discouraged because it creates unnecessary confusion between the otherwise easily distinguished genera. The genus Protopalythoa is not a valid genus, with all of its members now assigned to Palythoa (see Reimer et al 2006a). Palythoa mutuki (Indo-Pacific) Palythoa grandiflora (Caribbean)Aquarium ID: Polyps may be unitary or interconnected but are not embedded into the coenechyme (Reimer 2010). Oral disks are often brown or green. Tentacles are generally long and straight in contrast to the curled appearance of the tentacles ofPalythoa sp. “singapura” this, however, is not a perfect diagnostic. Common Variety Names: Green Implosion. 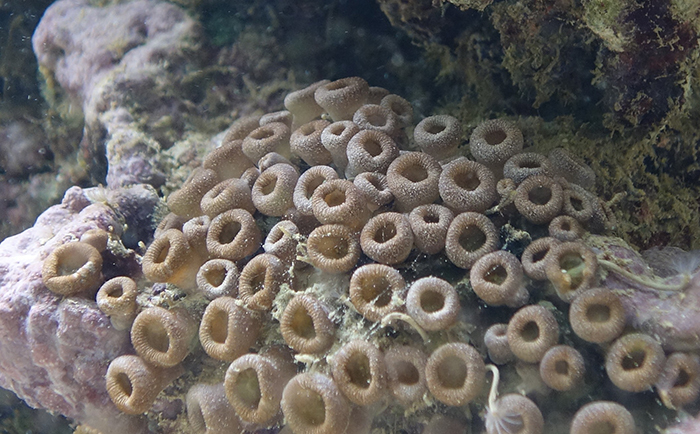 Palythoa grandis (Caribbean)Aquarium ID: Easily identified by its distinctively large polyps (Reimer et al 2012). Common Variety Names: Cinnamon Polyps. Known Symbionts: Primary symbiont is C1 (Lajeunesse et al. 2002, Santos and LaJeunesse 2006), a wide spread host generalist symbiont that associates with many coral taxa. It is adapted to high light but may be sensitive to temperature stress. Palythoa sp. “singapura” (Indo-Pacific) (sensu Reimer and Todd 2009) Aquarium ID: Polyps are larger than P. mutuki and P. grandiflora and polyps are often connected at the base to a number of other polyps. Common Variety Names: Nuclear Green, Captain America, Purple Death. Known Symbionts: Reported to associate with the same symbiont as Z. sansibaricus, tests with higher resolution genetic markers are necessary to confirm these reports (Reimer and Todd 2009). 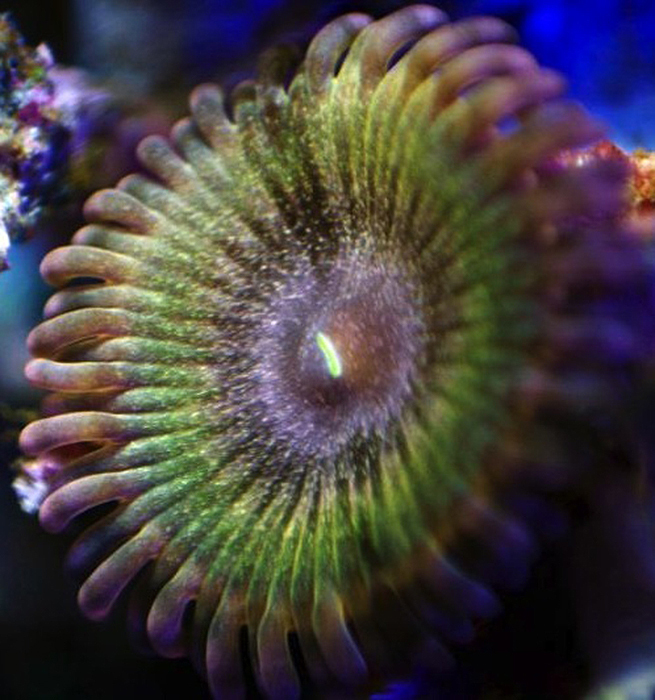 A Key to the Identification of Aquarium Zoanthids: The following section is an attempted to provide an easy key for identifying aquarium Zoanthid species using characteristics that are easily observed by hobbyists. These listed characteristics are common to most individuals in these species and are useful diagnostics for making a morphology-based judgment as to what species a Zoanthid belongs. It should be noted that in making such a simple key, the goal is to provide taxonomic resolution in the vast majority of cases while acknowledging that there will be exceptions. There are individuals in each species that stray a bit from the norm and so I expect that at least a few Zoanthid varieties will not follow the descriptions presented here. Please see Reimer et al. 2004, 2006a & b, Reimer 2008, Reimer and Todd 2009 and Reimer et al 2012 for more detailed and scientific descriptions. 1. Sand incorporated into outer column of polyps, polyps feel rough—-10. 13. Polyps contain green florescent protein or display some other florescent coloration— Palythoa sp. “singapura” (Indo-Pacific) References Fautin DG (2003) Hexacorallians of the World.http://hercules.kgs.ku.edu/hexacoral/anemone2/index.cfm Kamezaki, M., Higa, M., Hirose, M., Suda, S., & Reimer, J. D. (2013). Different zooxanthellae types in populations of the zoanthid Zoanthus sansibaricus along depth gradients in Okinawa, Japan. Marine Biodiversity, 1-10. LaJeunesse TC, Thornhill DJ, Cox E, Stanton F, Fitt WK, Schmidt GW (2004) High diversity and host specificity observed among symbiotic dinoflagellates in reef coral communities from Hawaii. Coral Reefs 23:596-603. LaJeunesse TC, Thornhill DJ, Cox E, Stanton F, Fitt WK, Schmidt GW (2004) High diversity and host specificity observed among symbiotic dinoflagellates in reef coral communities from Hawaii. Coral Reefs 23:596-603. Reimer JD, Ono S, Fujiwara Y, Takishita K, Tsukahara J (2004) Reconsidering Zoanthus spp. Diversity: Molecular Evidence of Conspecifity Within Four Previously Presumed Species. Zoological Science, 21(5): 517-525. Reimer, J. D., Ono, S., Takishita, K., Tsukahara, J., & Maruyama, T. (2006a). Molecular evidence suggesting species in the zoanthid genera Palythoa and Protopalythoa (Anthozoa: Hexacorallia) are congeneric. Zoological science, 23(1), 87-94. Reimer, J. D., Ono, S., Iwama, A., Takishita, K., Tsukahara, J., & Maruyama, T. (2006b). Morphological and molecular revision of Zoanthus (Anthozoa: Hexacorallia) from southwestern Japan, with descriptions of two new species. Zoological science, 23(3), 261-275. Reimer, J. D. (2008). Implications for different diversity levels of Symbiodinium spp. (Dinophyceae, Suessiales) within closely related hosts: zoanthids (Cnidaria: Hexacorallia: Anthozoa) as a case study. Galaxea, Journal of Coral Reef Studies, 10(1), 3-13. Reimer, J. D., & Todd, P. A. (2009). Preliminary molecular examination of zooxanthellate zoanthid (Hexacorallia, Zoantharia) and associated zooxanthellae (Symbiodinium spp.) diversity in Singapore. Raffles Bulletin of Zoology, 22, 103-120. Reimer, J. D. (2010). Key to field identification of shallow water brachycnemic zoanthids (Order Zoantharia: Suborder Brachycnemina) present in Okinawa. Galaxea, Journal of Coral Reef Studies, 12(1), 23-29. Reimer, J. D., Foord, C., & Irei, Y. (2012). 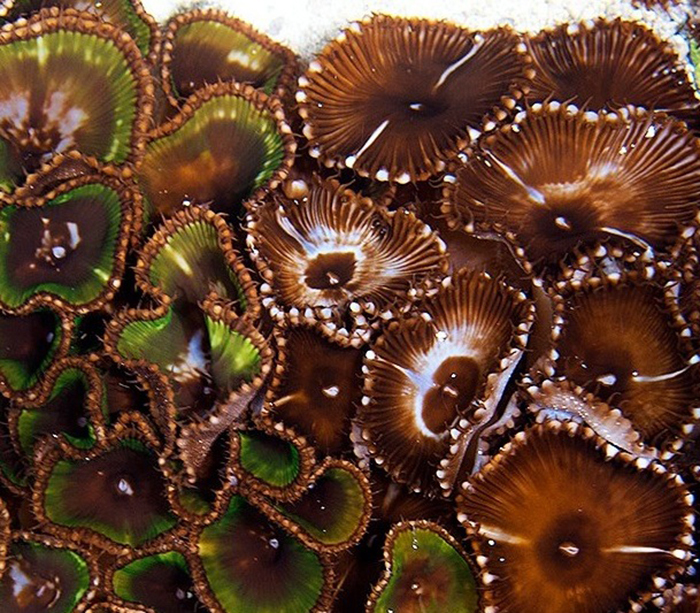 Species Diversity of Shallow Water Zoanthids (Cnidaria: Anthozoa: Hexacorallia) in Florida. Journal of Marine Biology, 2012. Santos RS, LaJeunesse TC (2006) Searchable database of Symbiodinium diversity—geographic and ecological diversity (SD2- GED). 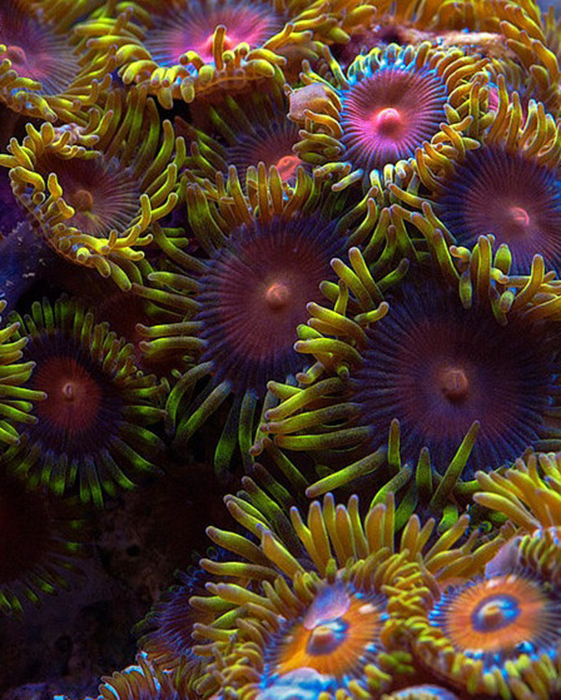 Auburn University.http://www.auburn.edu/*santosr/ sd2_ged.htm Wham, D. C., Carmichael, M., Reimer, J. D., & LaJeunesse, T. C. Eight polymorphic microsatellite loci for the Indo-Pacific-wide zoanthid, Zoanthus sansibaricus. Marine Biodiversity, 1-4.